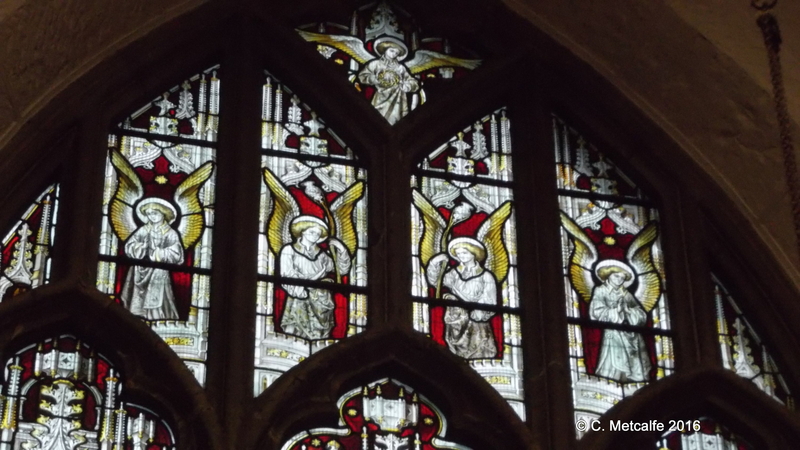 You can find plenty of angels in St Swithun’s Church. Look at the tops of 7 of the large nineteenth-century stained glass windows. 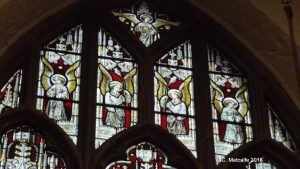 There are four angels almost at the very top on the East window, and 2 sets of 4 on the north side, and 4 sets of 4 on the south side of the church. On the south side, after the memorial chapel and near the south door, is a window depicting the Miracle at Cana in Galillee and Our Lord Teaching the Multitude from the ship. There are 4 angels at the top of this window. 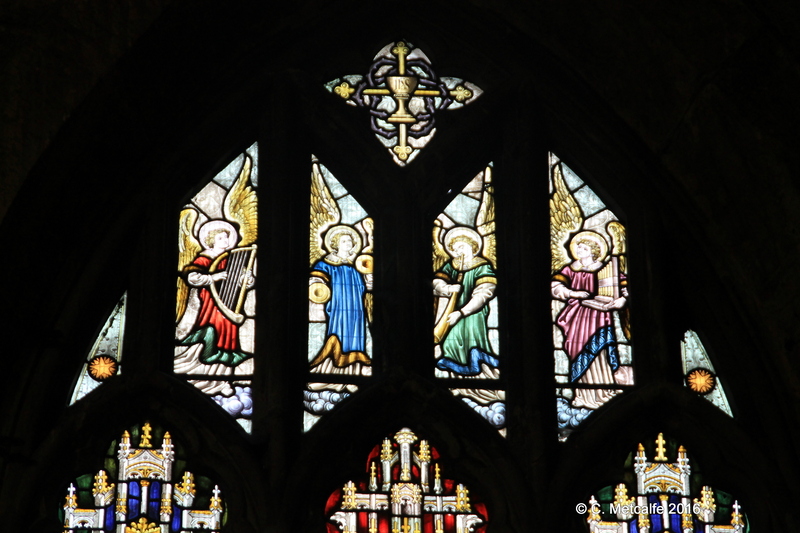 This window was given in memory of George Clarke by members of his family, and is the work of Hardman, 1879. There is a small brass plaque below the window, but it is hard to read. 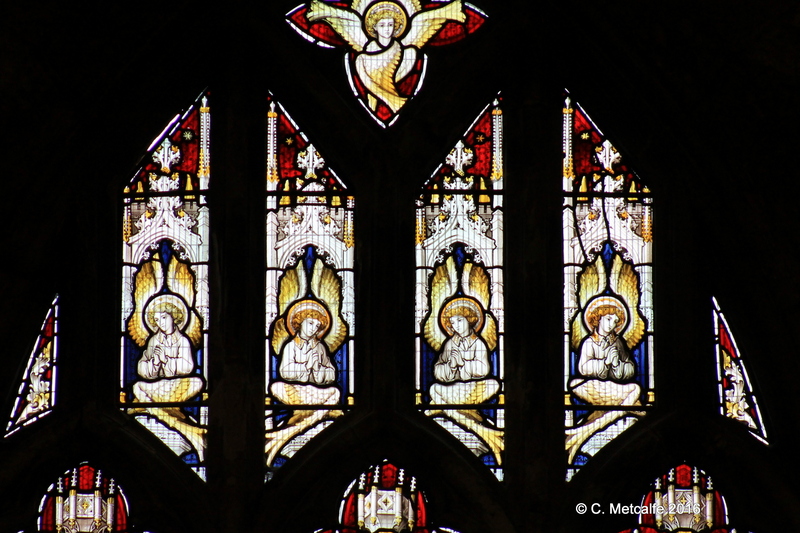 Moving towards the back of the church, there are 2 more windows with 4 angels on high. The next is the work of Clayton and Bell in 1887 and shows The Healing of the Paralytic and The Good Samaritan. It was given in memory of John Whyte. 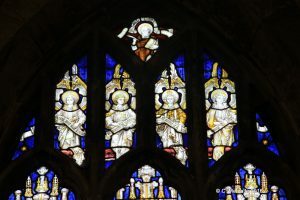 The angels, set against a brilliant blue background, hold banners to make up the phrase ‘Jesus went about healing all manner of sickness and all manner of disease among the people’. Just outside the Vicar’s vestry, the last window on the south side shows the Feeding of the Five Thousand and The Raising of the Widow of Nain’s Son. 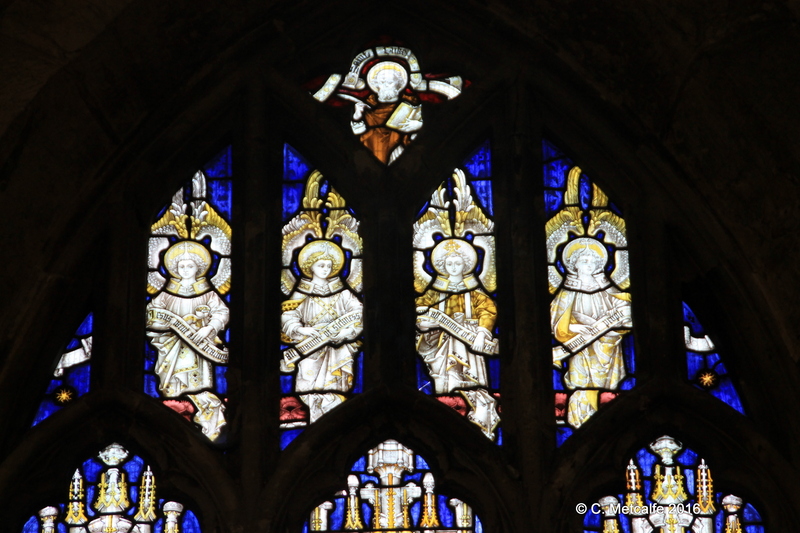 This window has 4 angels in different coloured robes, holding musical instruments. This was given in memory of Rebecca Clarke and is the work of A.O. Hemming, in 1904. 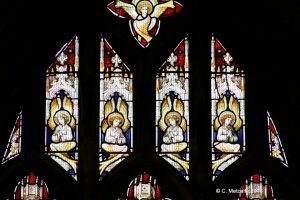 Before these windows were installed J.C. Stenning wrote, in 1868, that there was ‘no stained glass’. The windows of the south and north doors had ‘some diagonal pattern of a bad blue and dingy yellow’ painted ‘in very questionable taste’. 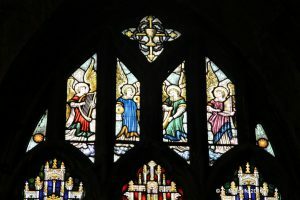 We are very grateful to those men and women in the nineteenth and twentieth centuries who gave the church its magnificent windows, and to the craftsmen who made the windows. It is good to find so many angels here in our own church. Guides to St Swithun’s Church 1946, 1975. The East Grinstead Clarion, Spring 2009, pp11-13, article ‘Our Stained Glass’, by Dr Christopher Wheatley. The East Grinstead Clarion, Summer 2009, pp12-13, article ‘Don’t forget Your Binoculars’, by Dr Christopher Wheatley.